AWARD WINNING ALPACA FARM IN VIRGINIA! Welcome to Clearview Farm & Ranch Alpacas! Established in 1999 in Charles City (Holdcroft), Virginia just south of Richmond where we proudly offer alpacas for sale in Virginia! We are experienced, proven breeders of award-winning Huacaya alpacas with superior genetics and championship bloodlines. We offer a full array of services ranging from quality breeding stock, herdsire (stud) services, boarding (agistment), fiber, alpaca products, and unlimited mentoring. 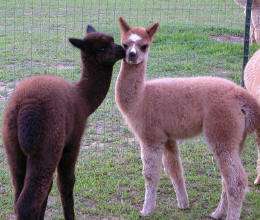 We are the registered trademark owners of “Huggable Investments” and are one of the elite alpaca farms in Virginia! One of our objectives is to transform the alpaca's extremely soft, hypo-allergenic, luxurious fiber into quality products such as gloves, hats, sweaters, throws, and more. We maintain a well stocked retail store on the premises of Clearview Farm & Ranch, in addition to offering you online shopping. We welcome you for a farm tour where your SATISFACTION is GUARANTEED! We aim to please and providing “Superior Customer Service” is paramount in all that we do. We respect your time and applaud your initiative in discovering the wonderful world of alpacas. Please allow us to ask you a few simple questions: (1) Do you currently own land? (2) Do you have plans on buying some land? (3) Do you have dreams of owning your own farm? (4) Would you like to establish some residual income? and (5) Would you like to invest in something that could quite possibly reduce your income tax liability? If you answered YES to any or all of the above questions you are probably wondering what the correlation is. Well, wait no longer because Clearview Farm and Ranch has the answer. The answer is: ALPACAS! Do not let advertised prices sway your decision of owning alpacas - we have a financing network available! Please beware that there can be vast differences between a $100 alpaca, a $1000 alpaca, and a $10,000 alpaca and we will be glad to explain those differences. Do not let the fear of raising a specialty livestock sway your decision of owning alpacas - we have a mentoring network available! 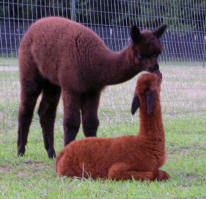 What is important at this stage is that you contact us to learn about the many benefits of owning alpacas. Our mission from the very beginning of our journey with alpacas has been to raise the highest quality of stock, encompassing both excellent conformation and exceptionally elite fiber. We have embraced the alpacas genetic heritage and have included alpacas from all three countries of origin (Peru, Chile, and Bolivia) resulting in a diverse and colorful herd with exceptional results! Our breeding mission has not disappointed us and has been well received by the industry and in the Alpaca Owners and Breeders Association (AOBA) Showring. Clearview Farm and Ranch is pleased to offer online shopping for unique, high-quality alpaca products. Visit our store by simply clicking here or on the “Store” tab on the left side of any page. EXCLUSIVE OFFER: If you currently own land and are interested in raising alpacas, Clearview Farm and Ranch has a special offer for you. We are located in Charles City, Virginia (Holdcroft). If you live within 100 miles of us we are willing to transport several animals to your location for a visit with family, friends, and neighbors. If you live beyond the 100 mile radius do not get discouraged, simply call us to discuss further details. Thinking of something to do this weekend? Let us help you plan a trip...stop by the farm around 10:00am then meander down the road a mere 2.7 miles to the fabulous Blue Heron Restaurant. © Clearview Farm & Ranch, Inc. All Rights Reserved.